Don't miss out on the best free games! Don't miss out on the best free games! Browse. Discover. Download. 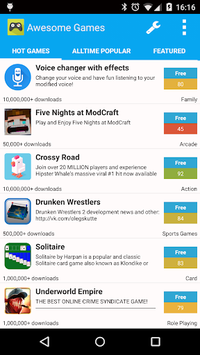 AppBrain Awesome Games gives you a convenient app to browse, discover and download the best awesome games available for your Android device for free. Also you can discover the latest app sales, to get those paid apps for a reduced price or even for free! We index the more than 3 million games on Google Play and pick out the best fun games just for you that are otherwise hard to discover. 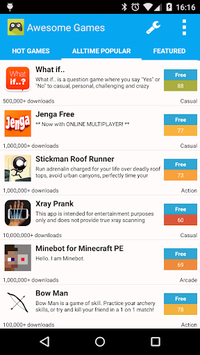 With this app you'll have more epic fun games to download than ever, and it's free! The games come from all game categories. In the first tab, "Hot Games" you'll find the best games that are popular right now. In the second one, "Alltime Popular", you'll find the games that have earned their place for being an all-time favorite of many users. We'll also give you personalized recommendations, that will suggest you to install games exactly to your taste. 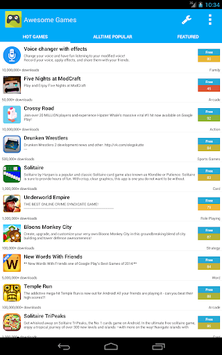 Finally, AppBrain shows you a number of featured free apps in the last tab. No matter whether you're looking for the best games ever, games for girls, boys or adults, this app will get you something you'll like. So don't wait any longer and download Awesome Games now!